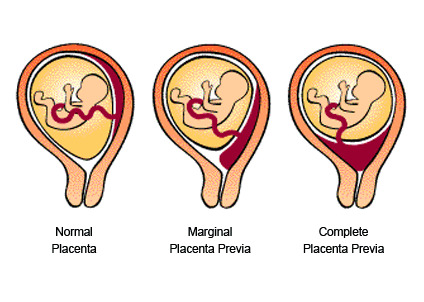 Placenta previa is a condition that is caused by poor implantation of the placenta. In this condition, the placenta is not perfectly placed in the uterus. The condition is rare as it affects only one in every 200 pregnancies, but it can be dangerous. There are coping mechanisms that the mother-to-be can engage in and these range from bed rest to support groups. Today, we will help shed more light on this condition. Placenta previa is a term used to describe the unusual placement of your placenta in the uterus. The condition is diagnosed when the placenta is lying low inside the uterus, usually next to the cervix or even covering the cervix. The placenta is normally located close to the uterus upper part and its work is to supply your unborn baby with nutrients via the umbilical cord. Usually, placenta previa is not considered problematic when diagnosed earlier on in the pregnancy. However, if discovered later on in pregnancy, it could cause various complications such as bleeding and may lead to an early delivery. If you are diagnosed with placenta previa close to your delivery period, you will have to give birth through Cesarean section. Partial previa. A partial previa is when the cervical opening is partially covered when it begins to dilate. You could also be diagnosed with a low lying placenta which is when the placenta is not really bordering the cervix but is close within two centimeters. Normally, the position of the placenta is checked at mid-pregnancy using an ultrasound exam. What Complications Can Placenta Previa Bring About? Placenta previa increases the likelihood of developing heavy bleeding during pregnancy and the mom-to-be may have to undergo a blood transfusion during pregnancy, at delivery and after delivery. If the baby is delivered via C-section, the obstetrician will deliver the placenta and place the mother on Pitocin along with other medications, if necessary. Pitocin is prescribed to contract the uterus and this helps stop bleeding from the implantation area. However, in the case of placenta previa, implantation occurs in the lower part of the uterus which would mean that the upper part will not contract. While contractions help, they will not stop the bleeding effectively. Women with placenta previa are more likely to have a deep implantation which is not easy to separate during delivery, and this is known as placenta accrete which can cause major bleeding requiring multiple blood transfusions during delivery. This makes the condition life threatening and in many cases, the doctor may have to undertake a hysterectomy to help control bleeding. Cases of placenta accrete are on the rise and as a result they are bringing about a rise in the number of C-sections undertaken. If a woman with a previous C-section has placenta previa, this increases their likelihood of developing placenta accrete. This risk factor increases greatly with multiple C-sections. If you are forced to deliver pre-term, your young one is at a higher risk of developing complications such as breathing problems and may have low birth weight as a result of the premature birth. Women who had been previously diagnosed with placenta previa are at a higher risk of developing placenta accrete, placenta increate and placenta percreta. These conditions are mostly confirmed using ultrasound scans, MRI or CT Scans. Managing this condition is not always complicated. Some doctors use the “watch and wait” approach which basically means keeping track of the placenta position. Care will mostly depend on whether or not there is bleeding. Most women are allowed to stay at home if they have easy access to a hospital, transportation and communication. It is advised that you have someone by your side at all times just to make sure that you make it to hospital when you need to. If you experience heavy bleeding or develop placenta accrete, your doctor will most probably recommend a planned C-section delivery. If bleeding occurs before you are due, you need to go to hospital right away to have the bleeding monitored and controlled. In some cases, the mum-to-be may be admitted until she is ready to give birth. This is only done if the bleeding stops. If bleeding does not stop, the baby may have to be born prematurely using an emergency C-section. In some cases, the bleeding on its own may cause premature labor. There’s not much you can do to change the placenta’s position. You can, however, control your health and well-being by eating nutritious meals that are rich in iron to reduce your likelihood of developing anemia. Your doctor will recommend iron supplements if you have low iron levels. If hospitalized, you need to drink plenty of water, move around and use compression stockings to prevent blood clots. If you experience bleeding in the second or third trimester, you must seek immediate medical attention.